For this Poster Monday spot we have the poster “Not another earth for life…” that belongs to Elham Khodabandeh. She was born in 1991 in Mianeh, Iran, and currently lives in Tehran. Elham studies M.A. of Graphic Design at the Tarbiat Modares University and she also works as a freelance designer. Her posters have been invited to international exhibitions in countries such as the US, Korea, Mexico, and Greece. Her work has been selected for contests like Escucha mi Voz and the International Reggae Poster Contest and has been featured in many foreign and inland exhibitions. In the poster “Not another earth for life…” there are two interrelated concepts. The first is that we have just one earth and we should not play with it like it is for our entertainment. The second concept tells us that we should keep it safe and healthy for the next generation. This contributes to the total subject of the poster, “Environment”. 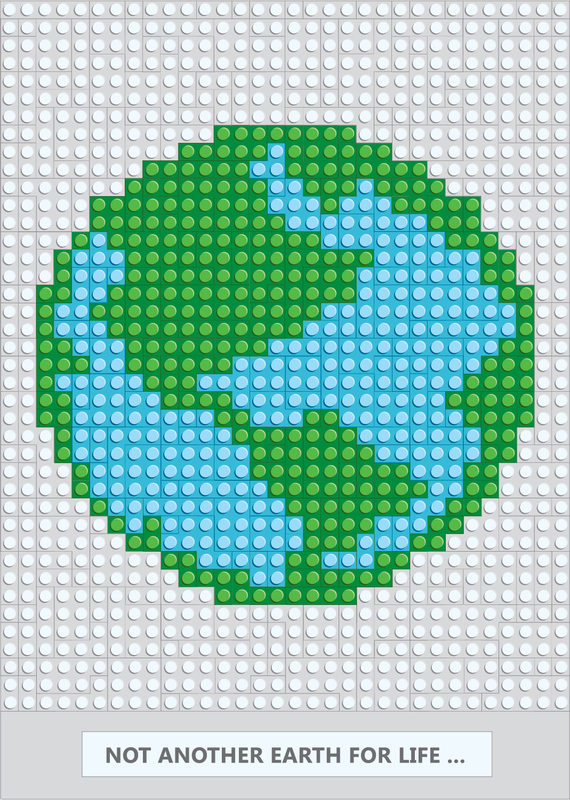 This concept is taken through the creative use of Lego’s to construct this earth. Sometimes it seems that talking about environmental care is a fruitless effort, but trying to change the mentality and actions to achieve it, will always be a valuable effort that we must continue to do. If you would like to know more of Elham Khodabandeh and her work you can visit her instagram account. The Poster Monday spot of the day belongs to Naandeyé García for her poster “what are you made of”. Naandeyé is a graphic designer who currently lives and works in Mexico City. She has a major in Design and Visual Communication at the Faculty of Arts and Design of UNAM, and a postgraduate in visual arts and multimedia at the Polytechnic University of Valencia, Spain. She received the GraphicsMatters 2017, Golden Prix prize of the Virtual Biennale Prague 2016, silver award “Award to! Design 2014” by “Brand Corporate”, and the bronze award of Quorum (Council of Designers of Mexico) in the category Multimedia in 2006. She has also won several honorary mentions and finalist mentions in some competitions in Mexico and abroad: Graphic Matters, Fl3tch3rexhibit, Bienal Nacional de Diseño, Taiwan International Poster Design Award, TAG CDMX, Mentes Maestras, Graphic Stories Cyprus, UNAM, MUMEDI, 8th Jeju, Korea United Designs, Flamantes, and Poster Poster. 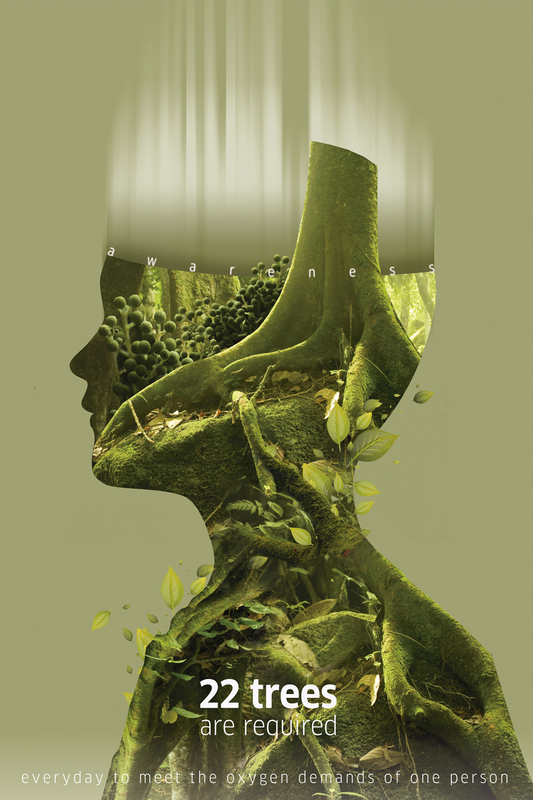 Today’s featured poster focuses on environmental awareness. It raises some interesting questions: What are you made of? What do you need to live? Where does the oxygen we breathe come from? How much oxygen produces a tree? These questions should serve as a starting point to motivate us, and therefore help us to become aware of how we care for our environment, our plants and trees. The poster “what are you made of” aims to visually reflect these questions. It seeks to make us aware of the importance of caring for our environment because caring enables life. Trees and plants absorb carbon dioxide and give off oxygen which gives us the possibility to breathe, and to live. “I believe that graphic design, specifically poster design, has the power to raise awareness about issues, and from it, has the ability to shape attitudes and behaviors in people. These are the premises, the poster is a visual complaint that seeks to generate an emotion in the viewer and get something out of that emotion, generate a thought, and from that thought generate an action: take care of nature” says Naandeyé. If you would like to know more of Naandeyé García and her work you can visit her web page.